Today’s Flash Back Friday comes from Episode 38, originally published in November 2010. Jason Hartman talks with Geoffrey Simmons about the CERTS program and emergency preparedness. Have you thought about the following questions lately? 2. Are most people prepared? You do you think they were as disasters around the world seem to appear on nightly news every day. 3. What basic preparation do people need to have around their home for preparedness? At school? At work? 7. How does one know to shelter-in-place versus evacuate? And how does a person prepare for either possibility? 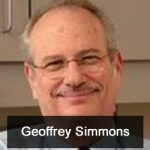 Geoffrey Simmons (born 1943) is a medical doctor, author, lecturer, trainer and intelligent design advocate in Eugene, Oregon. He is a doctor of internal medicine for the Peacehealth Medical Group in Eugene, boarded in internal medicine and disaster medicine.